This GM 9 tooth gear power window motor is a new, aftermarket replacement part. It is a direct bolt on and will fit either the driver or passenger side doors depending on vehicle model. This GM power window/regulator motor is just what you need to get your GM door window in good working order again! It makes a great replacement and has substantial cost savings over a dealer power window motor. Use your 8 mm wrench to disconnect the negative battery terminal. Pry up the window switch panel. Pry out and disconnect the courtesy light. Remove the door handle bezel panel. Take care not to let the tabs tear the leather while you remove this piece. Disconnect the door lock wiring connectors. Remove the two exposed Phillips screws. Lift the door panel up and off. Disconnect the speaker lead and set the door panel aside. Remove the three 10 mm nuts securing the motor. Mount the motor into the door. Bolt it in with your 10 mm socket and ratchet. Plug in your power window switch and connect the battery to test the motor before reassembly. Once you confirm that everything is working as it should, disconnect the battery again. Thread the wiring connections through their respective spots in the door panel. Mount the door panel onto the door. Clip both into the door panel. Use your 8 mm wrench to reconnect the negative battery terminal. Easy ordering, fast shipping, motor works fine. No complaints at all. Went on line...Found the Part...Got part...went on line and watched your installation video...BaddaBipBaddaBang installed the window motor. 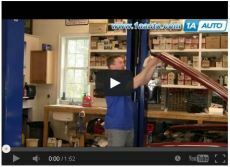 Smoothest auto repair I ever made...thanks for the hundreds of videos you have on file...makes life simple again. I can tell this is a quality motor, but unfortunately the mounting bolt hole locations were incorrect for my 98 LeSabre.